Through a modern ‘tale of two worlds’, Sally Rooney elegantly intertwines the stories of Marianne and Connell in a complex and tumultuous love story that brilliantly highlights the innate human desire to be loved. For anyone that hails from rural Ireland, Rooney’s depiction of small-town mindsets and social-structures will resonate as the two protagonists, living in a small-town satellite to Sligo, live two totally different existences. Connell, arguably one of the most popular boys in town, could easily be a character in an American chic-flick. Being the Irish equivalent to the classic American quarter-back of the football team, he is sporty, exceptionally handsome, academically superior to his cohorts and happens to fall for the wrong girl, who exists outside of his social sphere. Within Rooney’s reality, Connell serves as a means to highlight the fragile nature of masculinity with good looks and status as a high achiever doing little to deter his suffering. His debilitating anxiety and compulsive need to be accepted by his peers highlights how engulfed one can become by small-town mindsets and hierarchical social structures. From his friends, of whom are the human embodiment of lad-culture, Connell lives a secret life, hiding everything from the fact that he likes to read in his spare time to his secret relationship with Marianne, who among her peers, is regarded as a cold and unlikeable person. Marianne exists outside the social structures of rural Ireland, in a way she is too intelligent to find herself concerned with the opinions of others. All until she started to like Connell. Suddenly things of which she would previously have considered to be trivial start to matter. She finds herself pondering upon whether or not Connell will invite her to the Debs, only to be left disappointed and heartbroken. For many, the naivety of Connell and Marianne’s relationship will resonate, it encompasses the passion, heartbreak and innocence of young love that many of us look back upon fondly, but that serves as a hugely formative experience for the future relationships we may engage in. As their lives progress, both Connell and Marianne get accepted into Trinity College Dublin, marking a huge change in dynamics for the pair. Suddenly Marianne finds herself surrounded by a group of friends, something of which she never had when she lived at home, and comfortably slots right in among the rich, upper class students of Trinity. Despite her new-found confidence and social status, Marianne continues to struggle with an inferiority complex, she finds herself engaging in toxic relationships, in both a platonic and romantic sense. Her lack of self-belief makes a difficult, yet realistic and gripping read. The reader bears witness to Marianne falling deeper and deeper into a spiral of self-hatred that leads her to expect the worst from people and allows her to engage in demeaning and oppressive relationships. She believes she is unworthy of being loved. The roots of this notion having been formed within her dysfunctional family life and her early relationship with Connell, wherein he kept his time with Marianne a secret from everyone else. 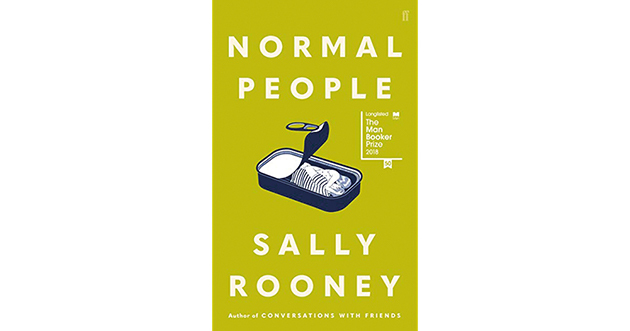 Rooney brilliantly intertwines the lives of Connell and Marianne, creating complex characters that are consistently drawn back to each other, regardless of their differing life experiences. From beginning to end, an understanding exists between Rooney and the reader, that these two young lovers are simply meant to be together. The reader feels caught within the battle that is Connell and Marianne’s relationship. Through their ups and downs, high points and low points Rooney creates an understanding with the reader, that these two young lovers are intrinsically connected.